BEMCO, originally an Engineering Craftsman's shop in the late thirties has risen to be a premier producer of HYDRAULIC PRESSES, HYDRAULIC RE-RAILING EQUIPMENT, WHEEL SET TROLLEY / AUXILLIARY BOGIE and many more. Factory & the administrative building is located in Belgaum, Karnataka, a southwestern state in India. BEMCO has a well-planned and adequately equipped manufacturing set-up where-in every infrastructure is available to design, develop and produce a mega range of HYDRAULIC presses & Portable Hydraulic re-railing equipment. 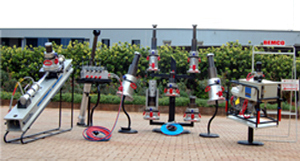 BEMCO, by collaborating with Vogel of Germany and Towler Brothers of U.K had manufactured the first ever indigenously produced Hydraulic press way back in year 1950. Today Bemco is manufacturing presses of capacity 200 Tons to 4000 Tons for varied applications. BEMCO, backed by the expertise of its highly qualified technocrats, professionals & dynamic leadership has etched its name as producers of high quality, reliable and easily maintainable Hydraulic presses & equipment. Bemco is collaborated with M/s S Dunkes GmbH Germany for manufacture of automatic straightening machines and wheel presses of single pressing cylinder version and double pressing cylinder version. With highly driven technical excellence & German technology partners, BEMCO has been able to produce and offer our clients with world-class machines and equipment manufactured using latest cutting edge technology.